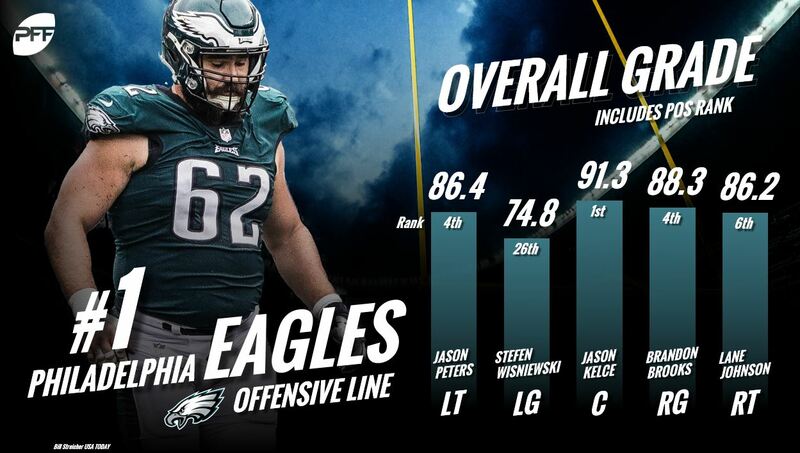 At PFF, we’ve put out our NFL preseason offensive line rankings for a handful of years now and they are never controversial and everyone always nods in agreement while reading. That won’t change this year as I’ve once again been put in charge of assembling the indisputable order of all 32 offensive lines in the NFL for the upcoming season. Using a combination of grades, college evaluations and age projections, we’ve come to the following starting-five rankings. A year ago, the Philadelphia Eagles earned the top spot heading into preseason, and after fueling a Super Bowl victory, they’ve once again placed themselves firmly atop our list. From there, we’ve seen some shuffling as three new lines have broken into the top 10. There is a little projection here as we’re assuming nine-time Pro Bowl left tackle Jason Peters will return to form after tearing his ACL and MCL in October of last year. At age 36, Peters is no shoe-in to do so. If he does though, the Eagles bring back the league’s best tackle tandem along with a top-five center in Jason Kelce and top-10 guard in Brandon Brooks. The great NFC East debate rages on with the Cowboys once again playing second fiddle. The three All-Pros aren’t enough to fill the two holes at left guard and right tackle – although those could be getting sealed this season. Rookie second-round pick Connor Williams should slate in nicely at left guard as we had a first-round grade for the Texas product even at tackle. At right tackle, La’el Collins rebounded after some early season struggles to at least flash some competent play down the stretch. If he can improve on his 51 total pressures allowed in 2017, they’re well on their way to earning back that No. 1 spot. One need look no further than the divisional-round matchup with the Rams to know that guard is an issue for the Falcons. In that game, Aaron Donald racked up 11 pressures against the Falcons interior (albeit without Andy Levitre). They’ve alleviated that to some degree with the signing of journeyman Brandon Fusco from San Francisco (76.0 overall grade on 1,083 snaps last season). They’ve been solid everywhere else though of late, especially at center where Alex Mack has posted back-to-back 88.0-plus graded seasons for the Falcons. 2018 marks the third-straight season that the Steelers will have their starting five intact heading into the year. 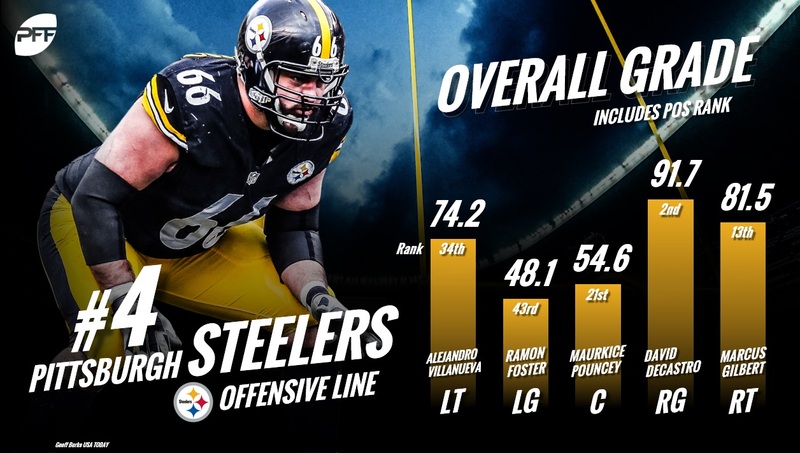 Expectations were ridiculously high for them heading into 2017, but an injury to Marcus Gilbert and uncharacteristic down year from Ramon Foster hampered their effectiveness. Still the entire starting five is 30 years old or younger and capable of recapturing their 2016 form. Taylor Lewan and Jack Conklin have both been top-16 graded offensive tackles each of the past two seasons. That doesn’t look to be changing anytime soon. The Titans interior isn’t quite on the same level, but even their lowest-graded starter a season ago – left guard Quinton Spain – earned a 73.6 overall grade. With no holes and a dominant edge duo, the Titans will once again be one of the best lines in the NFL. No offensive line earned a higher pass-blocking efficiency than the Saint’ unit did a season ago. One of the biggest reasons for that was the superb play from rookie tackle Ryan Ramczyk in Zach Strief’s stead. Ramczyk’s 96.6 pass-blocking efficiency was fifth best among starting offensive tackles. Their key though, will be the health of left tackle Terron Armstead who has managed only 1,064 snaps over the past two seasons after earning a 90.6 overall grade in 2015. AFC North: Who is the best newcomer to this division?